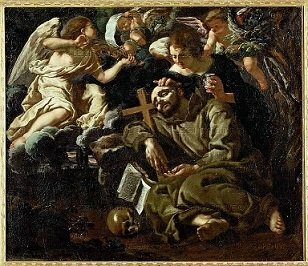 One of the most popular and well-loved saints in the history of the Church is St. Francis of Assisi, the founder of the Franciscan Order, the Order of Poor Clares and the Third Order of St. Francis. The story of his life has been set into countless books, plays, and movies. From the account of Richard P. McBrien, in his “Lives of the Saints,” Francis was born Francesco Bernardone in a make-shift manger on the ground floor of the family home in Assisi in Umbria in 1182, in a deliberate imitation of the birth of Jesus. He was baptized Giovanni in honor of John the Baptist, but his father Pietro (Peter) added the name Francesco (little Frenchman) because of his love for that country. Francis came into the world during the 12th century which saw the revival of commerce that caused the rise and expansion of towns and cities with a concentration of new wealth. The shift of masses of people from the farms to the towns posed a problem for the Church. The Church needed a way to reach the masses of people who clustered in slums around the walls of medieval cities and the new towns. The birth of Francis was providential – he was God’s gift to the world, especially to the poor. Francis was one of the seven children born to Pietro di Bernardone, a rich cloth merchant, and his wife Pica, who was originally from Provence, France. As a youth, he was fascinated with all things French. It is said that he spoke and sang in French fluently and effortlessly, taught by his French mother. Coming from the upper class, with considerable wealth, he led a carefree life spending his money extravagantly among his friends, indulging in the latest fashion and in long nights of partying. In addition, he loved poetry and music. When he was twenty years old, Francis took part in the war between Assisi and Perugia. The Assisians lost and as a result, Francis was imprisoned for a year in Perugia. Upon his return to Assisi, he fell ill and for a while he resolved to turn to a better life. But when he recovered, he returned to his frivolous life again. Hot in his military ambitions, he volunteered to go to Apulia as a cavalier. But when he reached Spoleto, he fell ill again. That must have been a wake-up call to him to be true to his resolutions. Then he heard a mysterious voice telling him about the vanity of all worldly ambitions. Immediately, he abandoned his military career and returned to Assisi where he was drawn increasingly to a life of prayer, penance, pilgrimage, and almsgiving. There was that irresistible call to follow Jesus Christ. When he saw the poor packed in misery around the towns and cities, the more he was convinced to follow Jesus and do something to alleviate the poverty of the people. For the last time, he gave a banquet to his friends where he announced to them his dream to marry a woman so noble and so beautiful that no one like her could be found in the world. This beautiful woman was none other than “Lady Poverty”. Out of this wedlock came many children who introduced reforms in society and even within the Church. One day, while Francis was riding down Assisi, he saw a leper and was filled with horror. He rode away at full speed but he had not gone far when he felt some remorse, so he went back to the place where he had seen the leper. He alighted from his horse, gave all his money to the leper and kissed the leper’s hand. By this gesture, he wanted to prove to God his true conversion. Later, he would go about the city in rags, helping the sick and the poor, with all the money he could get from his father. His businessman-father did not approve of his son’s extravagance. He was afraid he might squander his wealth so he thought of putting a stop to it. What did he do? He took Francis to the bishop and demanded restitution for all the money he had spent for alms. When Bishop Guido told Francis to return his father’s money, Francis took off his clothes and boldly declared: “…until now I have called Peter Bernardone my Father; henceforth I can say ‘Our Father who art in Heaven’ in whom I have placed all my treasures and all my hope.” Quickly, the bishop gave his cloak to the naked Francis. Thus, all his ties with his earthly father and family were broken. Earlier, while praying before a crucifix in the dilapidated chapel of San Damiano, Francis heard a voice speak to him: “Francis, repair my church which has fallen into disrepair…” He took it literally and started repairing it. At first, he used the funds he got from his father but after he was disinherited, he begged for stones along the streets. After he restored the chapel, he repaired the sanctuary of St. Peter’s at the entrance of the town of Assisi and then a little shrine of St. Mary of the Angels in Subiaso. All of these were done by begging and the people cooperated by working with him. Later on, Francis understood his mission in a wider perspective of moral and spiritual repair which he and his followers were destined to do in the Christian world. Wearing the simple tunic and hood of a shepherd, with a cord tied around his waist, Francis began to preach publicly and to attract followers. By the following year, there were twelve in his company as penitentiaries of Assisi, although Francis preferred the name fratres minores or lesser brothers or friars minors, which eventually became their official ecclesiastical name. With the twelve disciples, Francis went to Rome for the blessing and approval of the Church. Pope Innocent III approved this Rule of life and appointed Francis the First Minister-General of the Order. Going back to Assisi, he was determined to bring hope to the poor. He preached repentance, trust in God and the enjoyment of God’s goodness in the wonders of nature. For the rich listeners, he moved them to live simpler lives and persuaded them to help the poor. Following the Franciscan Rule – that is, to follow the teachings of Our Lord Jesus and follow in His footsteps, embrace simplicity, and poverty – wherever the Franciscans settled, they lived in simple wood huts without tables and chairs, had modest churches, and slept on the ground. Their preaching and exemplary lives brought about many conversions. On the night of Palm Sunday, 28th of March 1211, the beautiful aristocratic lady, Clare of Assisi sneaked out of her family’s palace and joined Francis at Porciuncula and established the Order of Poor Ladies, later called Poor Clares. And for those who could not leave their homes, Francis formed the Third Order initially known as Brothers and Sisters of Penance. Later, relinquishing his responsibilities as Minister-General, Francis had more time for intimate communion with God. In one of his retreats on Mount La Verna in the fall of 1224, the Lord gifted him with a mystical experience that left the five wounds of Christ’s passion on his hands, feet and side – the first recorded case of stigmata. He also paid a final visit to Clare at San Damiano and while there, he composed his famous “Canticle of Creation” singing the praises of Brother Sun, Sister Moon, and even Sister Death. Being very much in love with God, Francis saw the face of God in everything. One famous legend is his preaching to the birds. Not one of the birds flew away and Francis is often portrayed with a bird in his hand or on the shoulder. Another story is his taming of a wolf that devoured men as well as animals. As the days passed, Francis felt his physical condition deteriorating. He was suffering from the excruciating pains of his stigmata and the blindness caused by eye disease. He knew his pilgrimage on earth was already near. When it did come, he welcomed Sister Death joyfully, singing Psalm 142 – Voce mea ad Dominum, “I cried unto the Lord with my voice.” This was 13 October 1226 at Porciuncula. He was 45 years old. Two years later, Francesco Giovanni Bernardone was canonized a saint by his friend, Pope Gregory IX. The life of St. Francis reminds us to give thanks and praise to the Lord for all His creation. It inspires us to protect and enjoy nature as we are stewards of God’s Creation. If men followed his teachings, perhaps we would not be experiencing terrible natural calamities, and Mother Nature – God’s Creation – would take to us more kindly. Click here to return from St. Francis of Assisi to Catholic Saints.